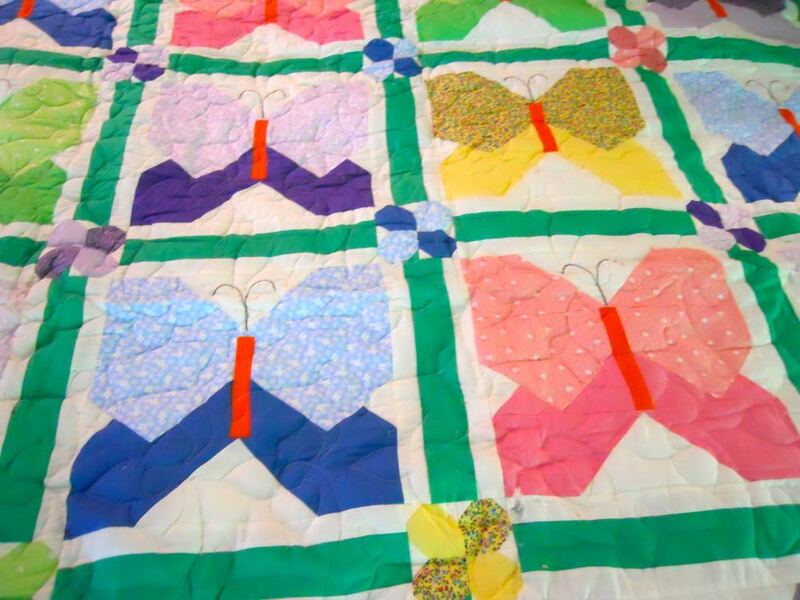 We have made dozens of custom, one of a kind handmade quilts for our customers and this unique butterfly handmade quilt is still one of my personal favorites. Combining an old-fashioned butterfly patchwork design, we combined the old-fashioned patchwork butterfly in a variety of different colors with the more contemporary flower blocks in the center of the blocks. I have seen both all butterfly quilts and all floral quilts but have yet to see a combination of flowers and butterflies. Since butterflies depend on flowers for nectar as flight fuel, it seemed appropriate to add flowers to the quilt design. Butterflies are among the pollinators currently threatened by our rapidly changing climate and less foraging area. To help all pollinators, we all should be planting less grass and more flowers and trees so pollinators have healthy food sources. This unique butterfly patchwork quilt celebrates the relationship between butterflies and flowers and serves as a reminder we should be planting more flowers!